Are you going straight for the prime this time? It would be lovely to see the 1000 on one card. IS the Prime available at the beginning?!?! Just seen in gd a prime trezeguet is on the market, so maybe all primes are in packs from the start. In which case, get on it JRL! If you don't have the prime by the end of the week. I always run a successful campaign! VanBasten! A goat from the old school. Can't believe you're excited for another year of this mess! SupaNoodle - I was looking back at the thread from last year and I think you posted on the FIRST page. And I can see you're in fine form once again this year! Good luck man. Looking forward to seeing your goals and team getting stronger. We're duly honored to have the blessing of a mod on the first page of The Goat Forum PART DEUX! The first action of the board is to sanction a non negotiable move for David Trezeguet. I can always count on you to keep challenging me. I remember last year you actually had me convinced that Henry was better at CM. I used him there for a while, too. And to be fair, he was rather good. But round these parts, that's just not enough of a share of the glory for him! I WILL get Trezeguet at some point this year, on my honor as a goat idolater. But I have to get THE goat first!!! Can’t wait for this. Loved your last journey. Another awesome forumer who also posted on the first page of my LAST thread. Incredible the continuity of support I've somehow fumbled into. Call me the Arsene Wenger of the forums! This time with a good player, amirite? Will the board provide the funds for this move? EddieFicio's motion only counts if you second it, Sergiu! Footy - a true GOAT forum LEGEND. So glad you're back to goad me into further goating. If the Prime isn't out - you're exactly right; I'll have to play with what I can afford. Farjestad, as a GOAT forum original, I take your word above all else. You're right - it's time to experiment! CON LA GOAAAAAAAAAAAAT! Similar to above, but I say work towards a full Icon team with better and better Icons around Henry over time. Regardless of what you do, I’ll be excited to follow along! mj4sp - another GOAT forum legend! You were with me the entire time last year. I'm really glad you've stuck around. Not so glad I have though. THIS IS GOAT FORUM NEWS! I can't believe it - the GOAT from the onset? Estimate on how much I'd have to pack to get him? Rebel - you and I are due for a game still! Glad you're back - hmu on Xbone after the game comes out and lets play. SERIOUSLY??? THIS is the expectation? One week from release? If you're going to make heinous demands, you could at least make them specific! It’s what we do; even against our will sometimes! It’s no small task that you respond to everyone, but you always do! That shouldn’t go unnoticed. Orange, my number one resolution this year is to harangue YOU as much as possible. I can't believe you took funniest forumer from me last year! Absolutely unbelievable! Thanks for the back-up, Cheetah. Orison knows he loves the GOAT forum - and that's just his way of showing it!!! Yes! Now stop making so much work for me! I have an introductory post to write!!! “My intention is simple” I said, vowing to bang “a thousand goals with [the GOAT]” – and boy, did I. First, I ran it out with the baby GOAT – fast, slick on the dribble, with surprisingly good finishing, I partnered him up with Benzema early on to great effect (at one point Benzema had 51 assists in 50 games). After 100 games with the 87 LW, I had scored 120 goals. What was even better is that I didn’t lose much money using him. I had the card the day before release (that’s before the game actually came out, people!) and I paid around one million coins for him. A month and one hundred games later, I sold it for close to the same. The 90 LW was an outright different experience than the 87 LW. Slower, stronger, less agile, but with an UNCANNY rocket of a shot, I had to adapt my playstyle – pairing him with a quicker striker to stretch the play off of Middle GOAT’s incredible hold-up play ability (Griezmann, Mbappe, etc). After 100 games I scored 119 goals. I actually got to 119 goals in 99 games, and my final game, if you’ll recall – only wanting ONE goal for the sheer beauty of similitude – some **** literally passed the ball around the back, all but refusing to play. Thankfully, though I don’t recall the exact figure, I made out well on this card too – maybe losing tax, if anything. The PRIME dropped on a day that I had a full slate of classes AND there was an actual Arsenal game on. 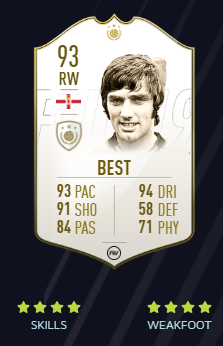 I remember being SO happy I somehow had the coins I needed – rushing through the SBC, thinking I very well could have been the first person in the world to have the PRIME Goat (probably not). And was he ever worth the wait. Scoring goal, after goal, after goal with him was, is, and remains a dream come true. And I got the chance to play with a lot of other amazing cards last year as well. Every dank PRIME ICON in the game, every Arsenal card I wanted, and the who’s who of Frances World Cup winning squad – while I began the year desiring or planning to play with all, or mostly, Gunner’s players, that dream quickly faded as my desire to simply what other, danker cards were like overcame me. And that brings me to this year – still dreaming. A full France team? Young Mbappe next to his older, hornier protégé? Trezeguet when I can afford it? Or, Aubamayang and a full-on Arsenal team with ICONS (Campbell and Lehmann are back!)? Perhaps something completely different – partnering him with George Best up top? The possibilities are endless, and while I don’t KNOW what the plan is yet, what I DO know is that…. My intention is simple: score a thousand goals with Thierry Henry. The rest is just theory. And we're glad to have you... EVEN if you troll me pretty hard from time to time! Yes, yes - that's true. But you're a MOD and you tied for funniest forumer - THAT is a tie-breaker! Amazing post. I am almost as hyped for watching this thread as I am for playing the new game! Watching you bang goal after goal after goal with the GOAT last year was brilliant. Couldn't have said it better. That thread kept me on the forum long after I'd lost interest in the game itself. although this year I won't be play as much as last year.